Fordell Firs Blog: Happy New Year! Above : Just a normal sunday flagbreak. Hope you all had a great Christmas and New Year - although the centre's open again there's not too much happening for the first few weeks so here's a wee look at what's been happening in the last month. 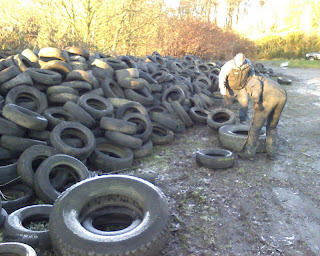 December started off with a fairly quiet weekend activity-wise, which meant only one thing for the staff...lots of time to get on with moving the endless pile of tyres from the old quad track down to the main car park. The good news is that the task is almost over, and they should be disposed of in the near future, but in the meantime visitors can experience the majestic sight of 'Michelin Hill' as they drive in (and it is even on the official site map, thanks to Ian). Onwards a weekend and it was the long-awaited staff/Fellowship Christmas party. 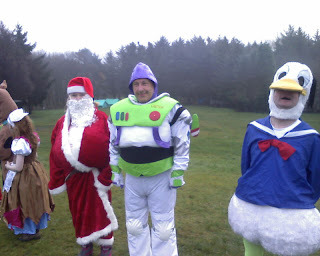 This year we were thrilled to receive a visit from not only Santa, but also a certain Buzz Lightyear and his friends during the same weekend (see photo above)...and although there was mild disappointment when they turned out to be the local cub sea scouts in disguise, their efforts were much appreciated and livened up the weekend. Above : Ali wins the Christmas talent show with his fantastic Kenneth Williams impression once again. After last year's successful Archery competition, it was time to try out the new crazy golf centre along at Halbeath for the highly competitive staff competition. Despite freezing weather everyone had a lot of fun, with old pro Henry teaching the youngsters a thing or two about how to play (see our exclusive video highlights at the end of this post). After that it was back to Fordell to get warmed up then off for a meal locally and back again to the conference room for another first - a staff quiz. 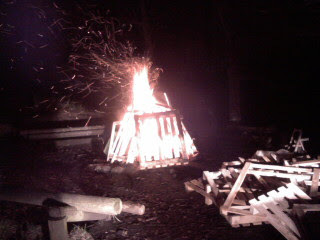 Cheers to Lindsey and Claire for organising this, it was great. Above : Nearly there - moving a few more of the tyres from the old quad track at the start of December. Onto the following weekend and we had a youth football team staying in the Henderson, who turned out to have one of busiest programmes of any group we've had staying...saturday saw them taking part in onsite actitivies for a couple of hours then being driven through to Lanarkshire straight after to play a game...then straight back for more activities! 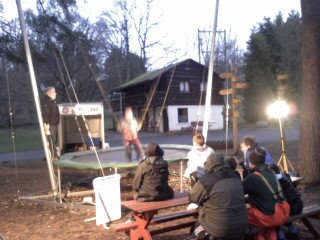 The only problem at this time of year is the lack of daylight hours, which resulted in us running out first ever fully-floodlit bungee trampoline session early on the saturday afternoon! 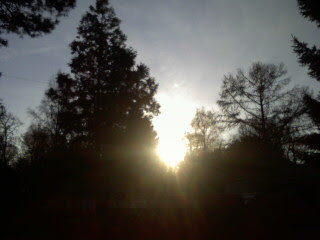 Above : Not much daylight in December - time between first and last photos was under a minute! Well, nearly. 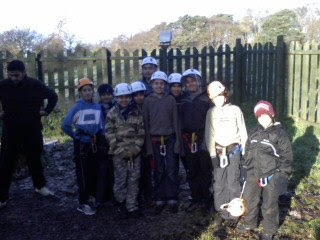 Although the centre is usually closed between Christmas and New Year, this year we had a busy weekend on the 27th/28th with a group of Edinburgh scouts staying in the Henderson Centre. The weather was pretty kind and although it was chilly in the mornings there wasn't much in the way of rain or indeed snow so all activities went ahead as planned. 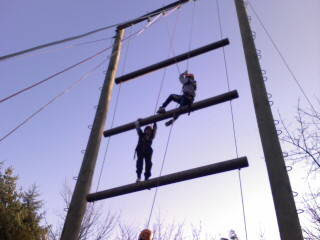 Above : Edinburgh scouts enjoying a very cold climbing session on the 27th December. 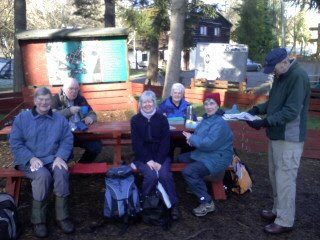 Above : The Dalgety Bay Ramblers popped in on the 28th December during one of their walks through Fordell estate and seemed surprised to see that there were actually groups staying and even pitching tents in the freezing cold. Above : the highlight of today's blog...sit back and relax whilst old pro Henry gives you a golf lesson!